Find your next trial participant. Inspire, reach and engage qualified participants outside of your network effortlessly. People are searching for your trials, PatientWing is there to greet them. Over 350K online searches for a clinical trial have shown a PatientWing page in the top results. Our 24/7 application portal allows people to apply for your trial and answer initial screening questions at any time, no more emails buried in inboxes or missed calls. Powerful patient management and collaboration tools let you and your team manage a patient’s journey from pre-screened to enrolled. Manage patients’ status as they move through the screening process and use notes and contact logs to keep your team up-to date. Schedule screening calls and appointments through PatientWing, with automatic reminders for patients. 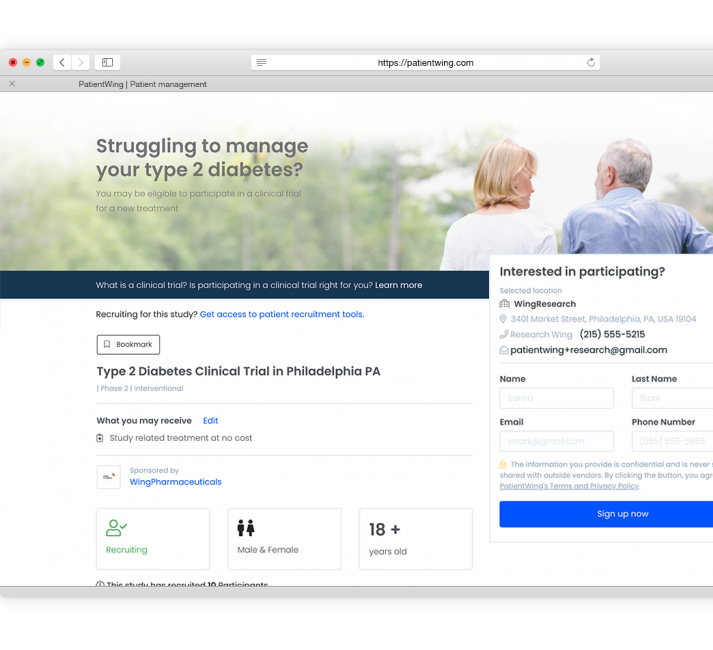 Building a relationship with your trial participants is crucial for a successful clinical trial, PatientWing can help you keep patients engaged and involved in your trial. Full patient dashboard with appointment schedule, trial details, and information about your research site. Notify your patients of upcoming appointments and changes in their enrollment status. PatientWing clinical trial listings are free of dense medical jargon, so patients can easily tell if they are qualified for a trial. Patients can apply to your study at any time and answer initial screening questions. Profiles are SEO-friendly and customizable. PatientWing helps you connect and engage with your next trial participants. Keep track of patient status and communicate with team members. Schedule screening visits and calls with patients. View and manage all your trial applications in one place. Keeps patients informed about their status. Remind patients about appointments and let them know when their enrollment status changes. Highly optimized for mobile, and supports virtually any type of device. Request access to your clinical trials as a primary investigator, coordinator, or as a member of the research team. Have questions? Need to talk to someone? Get in touch to learn about how we can help.